On the surface these badges look just like the professional model, but are thinner and lighter. The detail on the front is excellent for such an inexpensive badge. Inside a wallet case or similar holder you won't be able to tell the difference. 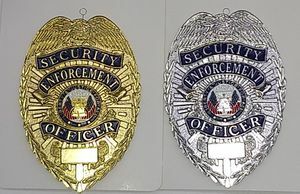 These security officer enforcement badges are made of heavy duty metal and are intended for use by security guards or other security professionals in need of physical evidence of his/her position. Even if you already have a security officer patch on your uniform, these professional badges are a great addition to your authoritative presence. These badges are easily fastened a uniform with the attached vertical pin and clasp on the back of the badge. They also work well in badge holders or badge wallets. This badge weighs about 2.5 oz. and has been designed with great detailing. The eagle at the top of the badge has wings that spread the entire width at the top of the badge. The scroll work with the words �Security Enforcement Officer� is set off with a dark blue banner. The center of the badge has two American flags in red, white and blue encircled with a blue banner that states �Liberty and Justice for All�. A leaf design borders the outer edge of the badge. This badge comes in a gold or nickel finish and sells for as much as $39.95 at other stores.